A massage gift voucher makes the perfect gift for birthdays or Christmas. Here's a quick guide to the different types of massage we offer. 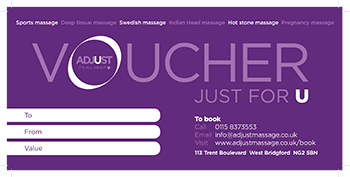 But don't worry if you're not sure which type of massage the voucher recipient would prefer as the vouchers can be used for any of our services, including biomechanics assessments. You can either choose a voucher that covers the full cost of a particular service or choose a set amount and let the recipient make up the difference if they decide to opt for a more expensive service when they make their booking. Sports massage - The perfect gift for someone who likes a strong massage or has a particular ache or pain. From £30. Deep tissue massage - Great for someone that wants a firm but general massage. From £30. Swedish massage - This full body massage is the ultimate relaxing experience so makes the ideal gift for someone looking to unwind. From £30. Indian head massage - Pure indulgence! The ultimate in bliss and relaxation. Focused on the scalp, face, neck, arms and upper back. £30. Pregnancy massage - Perfect for pregnant ladies in their second or third trimester. Helps to relieve aches and pains. £40. Back massage - This massage focuses only on the back so is ideal for anyone experiencing back ache. £30. Hot stone massage - The perfect gift for cold winter days! From £30. Reflexology - A foot and hand massage aimed at helping the body to heal itself. Perfect for anyone with health concerns. From £30. Biomechanics assessment - The ideal gift for the sporty person in your life. Assesses and improves movement patterns. From £80. To purchase a gift voucher - select the amount you want, enter the name for the voucher recipient and the postal name and address. We will post out the voucher to you straight away. You will receive a StrIpe receipt for your purchase. If you can't find the amount you want to spend, give us a call or send an email and we will arrange it for you.